Netvibes is well known as the leading personal dashboard platform, but it also extends its range beyond this by allowing users to add widgets to their websites and blogs. 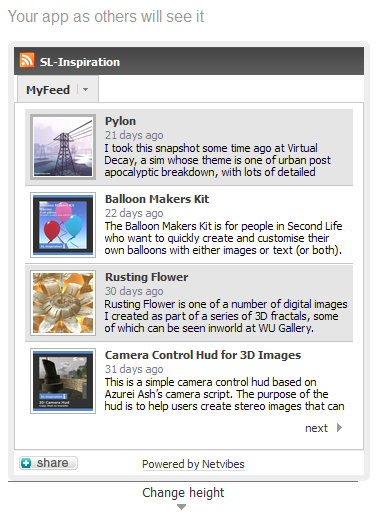 By following this tutorial you will quickly be able to add a multifeed widget to your own blog or website. 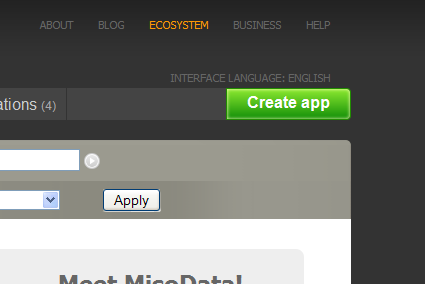 1/ Firstly go to eco.netvibes.com and click on the create app button at the top left of the page. 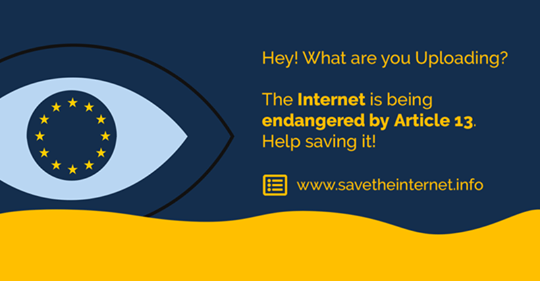 You may need to create an account with Netvibes first if you haven't already done so. 2/ In the window that opens, select the feeds option and click 'next'. 3/ Another window will now open which will ask you to add the url of the rss feed for the widget. Once you have added one rss feed you can add more, but for now we are just going to add the one. Click 'next step'. 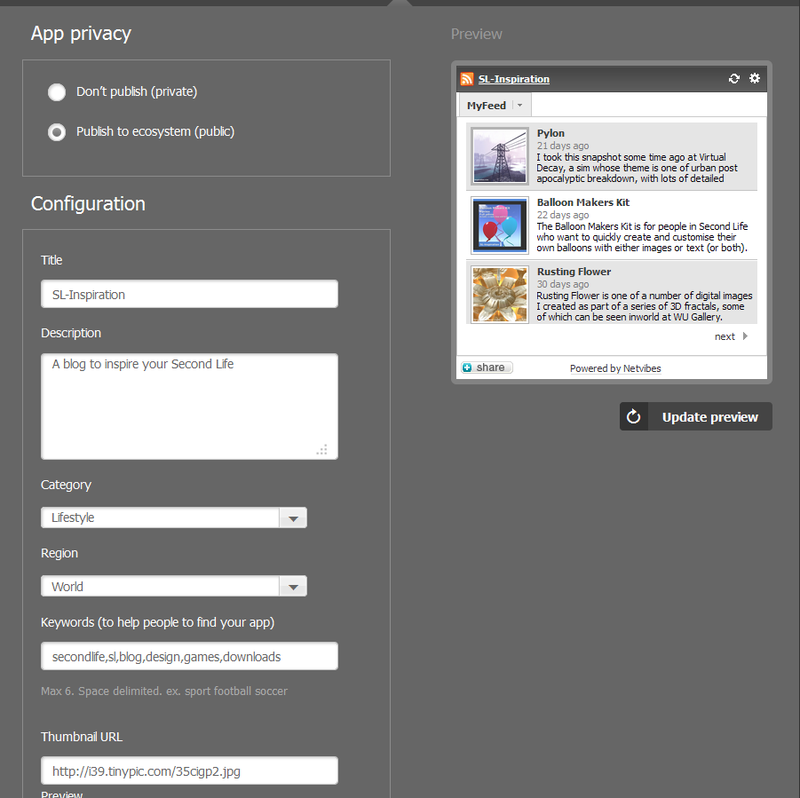 4/ The next window will allow you to configure your widget further by choosing a name as well whether you want to make it public. See below for the options. 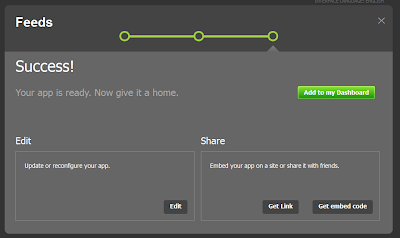 5/ Once you have agreed to the terms of service and clicked the 'next step' button again your feed is complete. You should now see a window that allows you to add the widget to your Netvibes dashboard, get the code to embed it on your website, or to go back and edit it some more. 6/ If you select the 'get embed option' another window will open that will enable you to add a few final tweaks to the feed, such as selecting the height and border colour. When you are ready you can copy and paste the embed code to your blog or website. You can get an idea of how the Netvibes widget will appear on your website by taking a look at the Second Life blogs feed on this page. 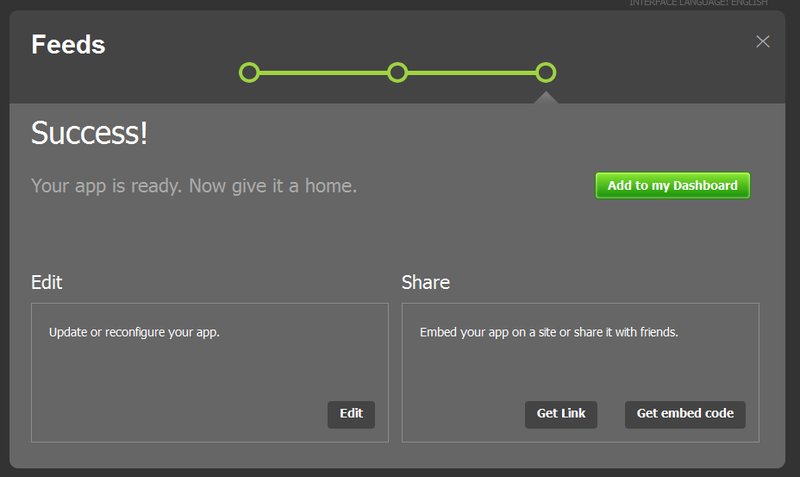 If you would like to embed this on your own website, just click on the share button to the bottom left of the widget. 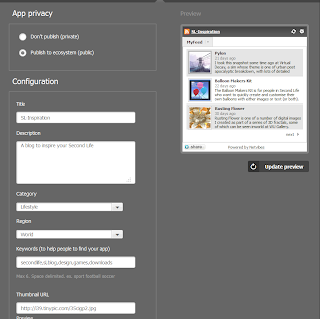 The Sl-Inspiration widget is also available from Netvibes and can be configured to blend with your own website. 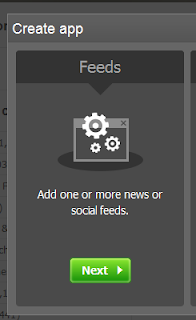 Creating a feed widget using Netvibes couldn't be easier, and whilst some blogging platforms will allow you to create similar feeds, they tend not to be as flexible or look as good as a Netvibes widget. 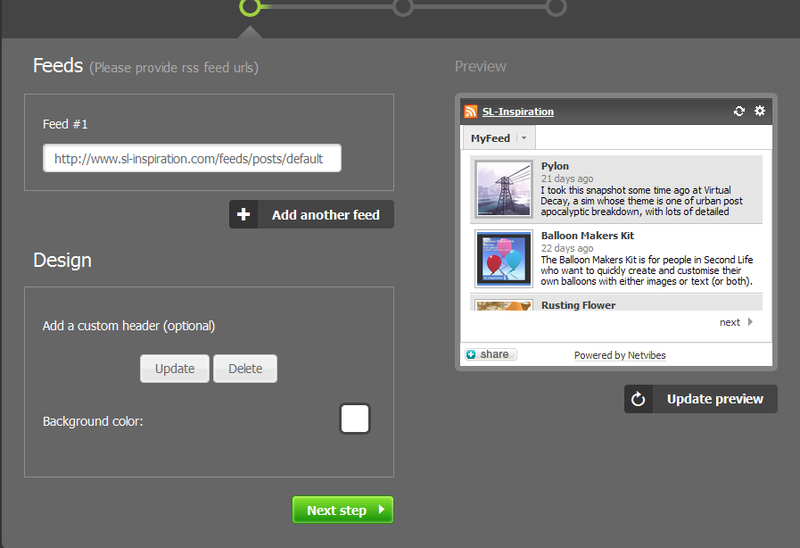 After following this tutorial you could have a Netvibes feed embedded in minutes.